Hi Everyone! I provide proofreading and editing (copy-editing) services. Whether you require just proofreading or editing as well as proofreading I will cater to the customers' needs. I will proofread anything from a letter to a dissertation. I love a challenge so if you have a manuscript you need to be looked at then I am the right choice! Simply put, I love what I do! I have the patience and careful eye for detail to proofread and edit with 100% accuracy. I am dedicated and committed to every project that I work on. I work efficiently and have a fast turn-around. Having your work proofread and edited can save you a lot of embarrassment and negative online reviews due to poor grammar and spelling. My work involves a careful review of documents and manuscripts before publication. This involves checking for spelling and grammatical errors, syntax and clarity, ensuring that the formatting is correct and that the correct punctuation is used. 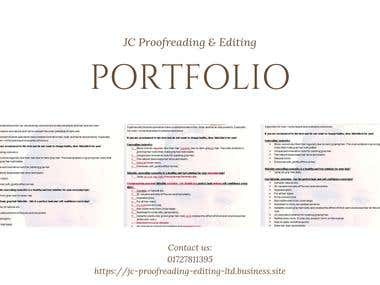 I have recently started my own proofreading and editing company. It's extremely rewarding as I am doing what I love. I was a self employed sole trader. I was an online retail reseller.